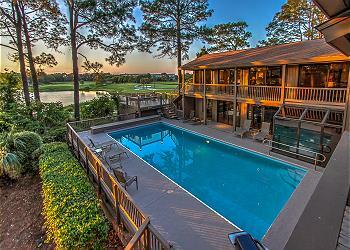 Wide open indoor and outdoor island living in this 2nd-row ocean Palmetto Dunes home! The entry reveals a completely open, and well-appointed living space that includes the den, kitchen, dining and living rooms. A wall of windows and glass doors in the living room looks out on the very private pool area with a *heated pool and plenty of space to lounge about without a worry in the world. Plus there’s a comfy screened in porch with a bathroom right off the pool. And there are no less than 3 king master bedrooms all with private baths. 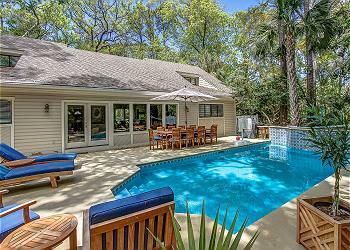 This is island living done right, all just a few sand-between-your-toes steps from the beach! •	Private *heated pool (18 x 21 kidney) *This pool can be heated at an additional charge and has a gas pool heater. The cost per week is $575-$875 depending on the season.